Rear wheel, fittings & rim tape. Owners of old Brompton frames beware. The threaded axle on this unit may have a diameter that is too wide for your dropouts. Early Bromptons were designed for 3-speed hubs which featured flats on the threaded axle to engage with the frame and stop rotation. As a result, axles without flats do not fit these older frames (older frames can be modified for single-gear use by filing the dropouts, but may not be compatible with the 2-speed derailleur. New 3-speed hubs also use a different system). May I know what is the prices of this wheel-set? What is the shipping cost to ship it to Singapore? Unfortunately due to the shipping restrictions we cannot ship to Singapore. Is this the current 2019 rear wheel? Is this the current 2019 rear wheel for BOTH the single speed and 2 speed? What is included- Does it come with the wheel nuts and washers? Yes this is the most current rear wheel for single speed and 2 speed. Yes nuts, washers and a rim tape are included. Could you provide me the weight of 2 speed factory supplied wheel? I am slightly confused. There is no mention of using the Locator Washers (as on 3 speed) with the top facing the Top. Are these Locator Washers not used on a 2 speed? This wheel weighs 726grams on our scales. 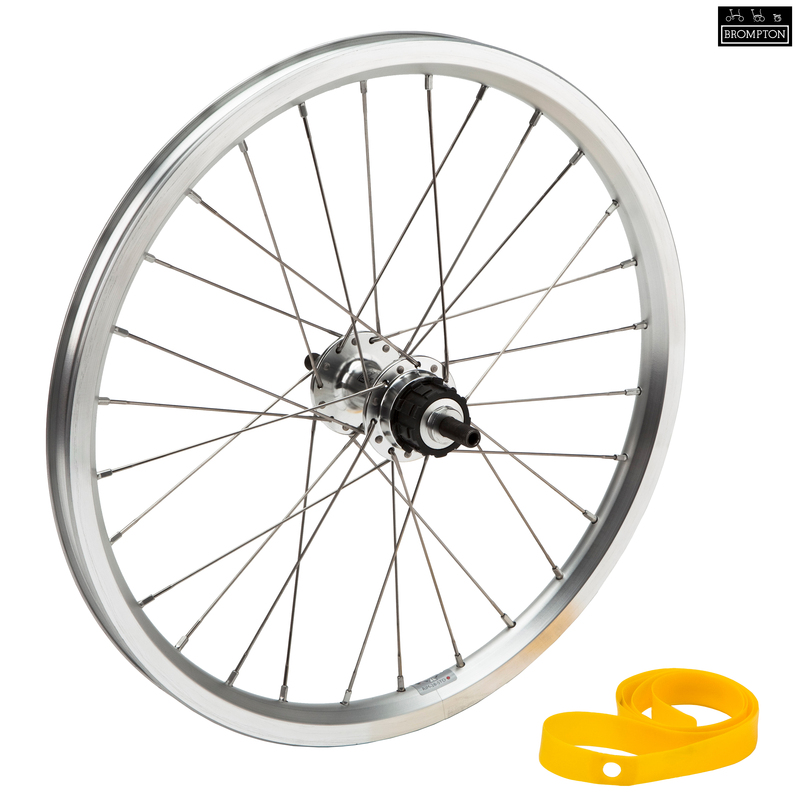 The 2spd wheels do not require the locating washers like the 3spd hubs do. Do Sturmey Archer Cogs Fit ? Do I need to buy rear cog ? or is it standard/ fitted/ included ? The sprockets required for this wheel are not included. The ones required are the Brompton 9 spline fitting sprocket set. Does The Wheel Use The New Double Wall Rim ? Looking from the picture, it still use the single wall Rim and not the double butted spokes. Yes these are the new wheels with the double wall rims. This wheel does use double butted spokes, its just hard to tell from the picture.